The big red Cotton Gin stor e on NC Route 158 seems an unlikely place for a winery, so we were dubious when Mom pulled in and said we were going to stop for a tasting on our way to the Outer Banks. Surprise! We found a quaint and growing winery with very tasty vintages surrounded by a vineyard heavy with grapes that were sweet and bursting with flavor… some of which were scheduled to be picked the next morning. Half hidden in our smuggle bags, Roy and I made our way on Mom's and Dad's shoulders through the Cotton Gin's many twists and turns. We passed through room after room of enticing goodies, inviting linens, and charming country crafts before finally stepping down into our Sanctuary in the guise of a small rustic tasting room in what was originally part of a working cotton gin. Hint… park in the south parking lot. Winemaker John Wright, whose family has owned and farmed the property for seven generations , served as our host. He was very gracious, although he did note Roy looked like he had already had one too many before we even started tasting. When he observed how much I enjoyed my tastes, he suggested they might start marketing "wine for the emerging dog market." Uncle Jeff enjoyed his sense of humor. John told us his family started the winery in 2001, as a way to preserve the family's farmland - once used for cotton, then tobacco. They started producing wine in 2003. He let us taste a wide variety of wines from Sanctuary as well as the other two North Carolina coast al wineries - Moonrise Bay and Martin Vineyards, the oldest of the three. Most popular by far were the fruit wines - the blackberry and raspberry were just released, and locals kept coming in to pick up a bottle or a case. 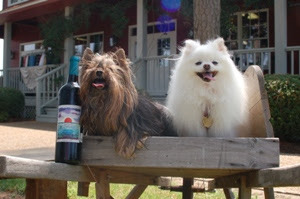 Our pack favorite was the Sangiovese, red Italian grapes that grow well in Currituck's sandy soil. We bought a bottle to take home and enjoyed with grilled steak on Monday night. Pure fantasy. The bottle is a work of art - each year, the label is designed by a different local artist. This year's is a sunrise collage by Martha Johnson. Two other ARF-fully interesting wines: The Wild Pony White is a crisp, citrusy, and refreshing sauvignon blanc. You can imagine enjoying it on Corova Beach… and proceeds benefit the Corolla Wild Horse Fund. And don't miss the Sweet Serenity, made from the native muscadine grape - travel logs from the first colonists at Roanoke Island noted grapes growing wild along Carolina's shores. It has a unique and very earthy flavor. A great start to a great beach vacation! Wine Dogs Drink Naked... Well Duh! A beautiful Saturday afternoon brought us up to the lush fields of Naked Mountain Winery, one of the oldest wineries in Virginia. I think they must have been expecting us at Naked Mountain, because the front door had a sign that said "Attention. Chien Bizarre!" We had an extensive interview with Pho ebe Harper, who built Naked Mountain with her husband, Bob, 31 years ago. At the time, they were one of five wineries in the state... today, Virginia has over 80 and is still growing. With all the awards VA wines are winning, some are calling the Old Dominion State the New Napa. Naked Mountain's Petit Verdot 2004 won a gold medal in the Virginia State wine competition this year. Because of their inventory, Naked Mountain is able to let their wines age a little longer, and it certainly made for a yummy PV! The wines were so good, in fact, t hat Pomeroy finally broke down and got a few licks in himself. Usually, I have to drink alone. I guess he heard Naked Mountain wines have been served at the White House. Twice. He's fav was the Merlot. As you can see, we were both pretty much in the bag after Cousin Drew, the marketing and sales manager, guided us through three whites and three reds... we're not really related, but Drew is a Hauser too, although a bit taller than my side of the family. We chose the signature Chardonnay to take out to the deck and enjoy... very fruit forward and a great summer sipper. We were entertained by several tiny hummingbirds taking frequent sips of their own from the feeder. We were assured it contained nector, not wine, although the Riesling was very sweet. You could say hummingbirds are the toy dogs of the avian world. Turns out the true Chien Bizarre was long-time winery dog Freddie, a black lab/hound who went to the Rainbow Bridge in January. 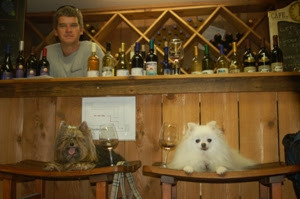 But this dog-friendly winery still collects for the Fauquier County Animal Welfare League in his honor. .